KUWAIT: Three people narrowly escaped death when firemen rescued them from a fire that broke out at their house in Dhahr, said security sources. Firefighters from Mubarak Al-Kabeer and Qurain fire stations rushed to the scene immediately after the blaze was reported, and they managed to control the flames without recording any casualties. 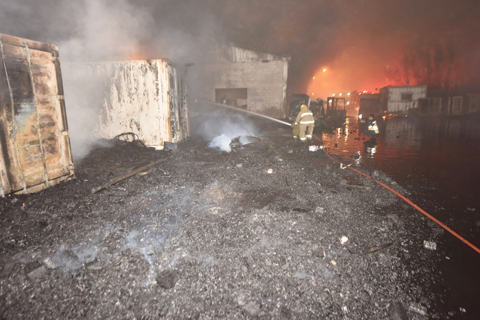 Another huge fire broke out in a beverages’ factory in Sabhan, which started in an open yard and part of the factory that contained fuel and packaging material. It took the efforts of 130 firemen to contain the fire which extended over an area of 4,000 square meters, sources said. Firemen from Sabhan, Farwaniya, Mubarak Al-Kabeer, Salmiya, Mnagaf, Operations Center, Backup Center, Suliabikhat and Al-Hilali fire stations responded to the blaze. Traffic police launched an inspection campaign over the weekend to track and apprehend reckless drivers, the Interior Ministry’s relations and security media department announced yesterday. The campaign resulted in filing 25 traffic citations, impounding 24 vehicles and arresting 21 violators. The campaign was launched at 8:00 pm on Thursday and lasted until dawn on Friday. It covered the Arabian Gulf Road, the Second Ring Road, Damascus Street, Morocco Expressway, Ibrahim Al-Mezyan Road and Jahra Road, with participation of 35 police patrols as well as 84 officers and warrant officers. In another update, the department announced that articles 41/2 and 41/5 of the traffic code pertaining with accepting reconciliation in minor traffic accidents would take effect starting today. A driver who causes an accident and admits his or her fault inside a police station will be fined KD 20, and then reconciliation documents will be sent to insurance companies for compensation without having to go to court, the department explained. Further, the department explained that in case of minor accidents and upon all sides’ consensus, reconciliation would be accepted and drivers would have to remove their vehicles to prevent blocking traffic flow. “However, if no agreement is reached, the drivers involved would have to go to the concerned police station to settle the matter,” the department added. The department also warned that drivers who refuse to remove their vehicles off the road would be fined for blocking traffic flow.